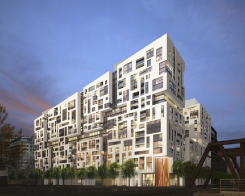 Minto Westside is a visually stunning architectural gem located along the Rail Corridor in Toronto’s Entertainment District. While this is a brand new building, in an attempt to fit the surrounding warehouse lofts that the area is known for, the design incorporates many large factory-style windows in varying sizes. The amenities here will suit your every need and impress your guests. Not one, but two outdoor courtyards exist between the two towers. On the west, a beautifully landscaped courtyard comes with an outdoor fireplace, lounge, bar and comfortable waterside seating area. On the east, a social pool area with lots of lounge space. 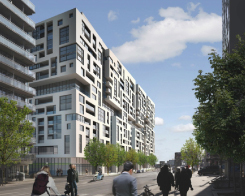 Centrally located between the Toronto waterfront and the vibrant scene of King West, you couldn’t ask for a better place to call home. Just beyond your front door is the green grasses of Victoria Memorial Square Park and south of you, out your window are the green planes of the historic Fort York. 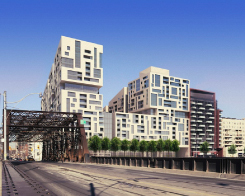 Accessibility is no issue here, not only are you close to the King Streetcar, but you’re a minute drive to the Gardiner Expressway and Lake Shore Blvd, not to mention Billy Bishop Island Airport!